Last week, exotic handbag designer extraordinaire Carlos Falchi had an event at Bergdorf Goodman in New York City. Naturally, I had to pop in to say hi and see the newest designs from the master. His area at Bergdorfs was filled with fans and shoppers picking out designs and having Carlos sign them. With the shopping mood in full force, I began to examine every Carlos Falchi bag I could get my hands on. Everyone including myself were buzzing about the superb quality and the fact that his bag are made in the USA. 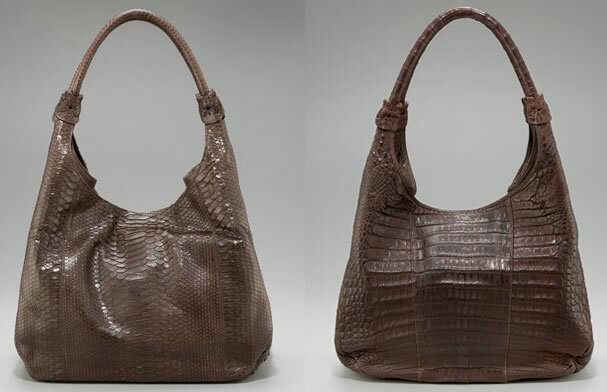 Right now I am coveting the classic Carlos Falchi Hobo in both python and crocodile skin. As fall attempts to set in, I find myself drawn more and more to brown bags and both of these are stunning options. Carlos allows skins to standout on his designs in place hardware, logos, and other extra fluff. A hobo is a must-have shape for every handbag collection and because it will be used often in your rotation, so investing in an exotic pays off in the long run. Dimensions of both are 11″H x 13″W x 7″D with a spacious 10.5″ shoulder drop. All this leaves me with is deciding which option is better; python or crocodile. And truthfully, if that is all I worry about today, I say this is a great day. Python is $2,495 via Neiman Marcus and Croc is $3,995 via Neiman Marcus.